Some parts of the city and its suburbs received around 100 mm of rainfall since Saturday morning, marking the arrival of monsoon. While a 13-year-old suburban resident died after a tree fell on her, three others were killed in rain-related incidents in the satellite towns as heavy showers led to water logging in several areas. In three hours, the Colaba observatory received 108 mm of rainfall. From 8.30 am to 11.30 pm, Colaba received 160.8 mm of rainfall and during the same time, Santacruz received 98 mm. According to the civic body’s disaster management cell, on Saturday at 9.38 pm, a tree fell on S N Dube road, Dahisar, injuring a 13-year-old girl, Drushti Mungra. She was taken to the nearby Rohit Nursing Home. Dr Uday Yadav from the nursing home said: “She suffered a head injury. She was declared brought dead.” The police of registered an accidental death report in the matter. According to the doctor, the trunk hit her head leading to the death before any medical intervention could be provided. The body was taken to Kandivali Shatabdi hospital for post-mortem. On Saturday morning, Priyanka Zhende (22) was run over by a tanker near Kamgar hospital in Thane. “Due to the rains, the tanker driver did not see the scooter and rammed into it. After the girl fell off the scooter, she was run over. She died on the spot,” an officer from Thane police station said. “We have lodged an FIR against the unidentified driver for culpable homicide not amounting to murder under the IPC,” the officer added. In the other incident, a 36-year-old carpenter who was pushing his autorickshaw on a flooded street in Bhiwandi on Saturday morning got electrocuted. “The deceased has been identified as Ali Akbar Ansari. We have lodged an accidental death report and are investigating further,” an officer from Bhiwandi police said. A fisherman Steni Admani (66) died in Thane district after being struck by lightning and died on the spot. The incident occurred at around 6 am on Saturday at Patanbunder area of Uttan in Bhayander. Six others, continued on page who were out in the open at the time, were also injured due to the lightning were rushed to a local hospital said Shivaji Patil, chief of district Disaster control cell. 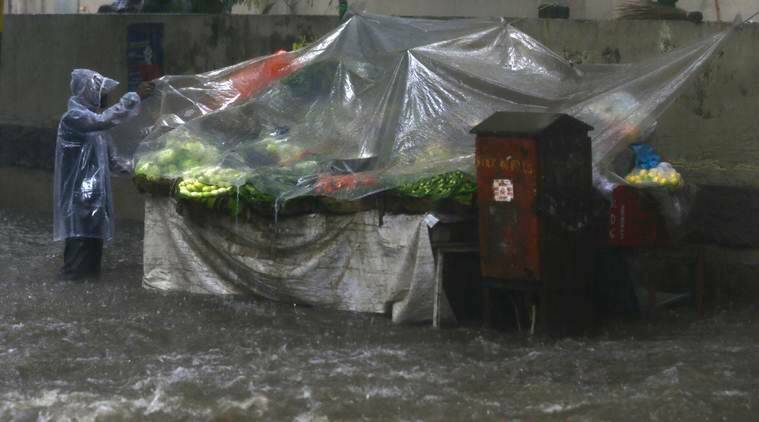 Meanwhile, the Brihanmumbai Municipal Corporation (BMC) disaster control room said water logging was reported at 11 spots across the city, including Hindmata in Dadar, Dadar TT, Parel TT, Dharavi, Kings Circle and Sion Road no 24 where the water level rose up to 1.5 feet. The disaster management unit of the civic body said 3,000 personnel have been pressed into service to help look after rain-related problems. “There are a few areas, where we could not control waterlogging but that was due to pending work and heavy rain in the area. For example at Hindmata, we are yet to complete the work, while the central suburbs on Saturday received almost 119 mm rain leading to waterlogging. Still, compared to last year, the speed at which the water was receding was high. Our pumping station was working in full capacity. 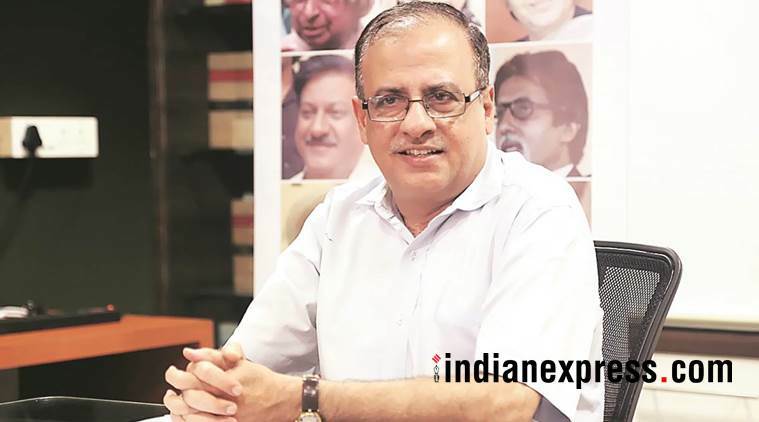 The trash boom project helped to a large extent,” added Mehta. A senior BMC official said: “Following rains last year corrective measures were taken around 120 spots in the city. Most of them did not witness water logging on Saturday. The areas include Andheri-Kurla road, Swagat Hall in Santacruz, Jaybharat Colony in Santacruz, Oberoi Mall in Goregaon, Lokhandwala circle, Shrikirshna Hall and Anand nagar. 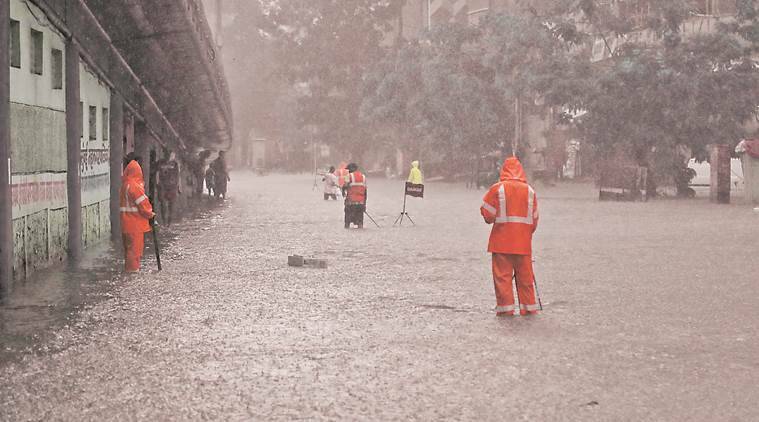 Apart from 3,000 BMC workers, the National Disaster Response Force (NDRF) teams were deployed at various junctions, including at Hindmata and Parel, which is the worst-hit. Those were withdrawn in the evening. 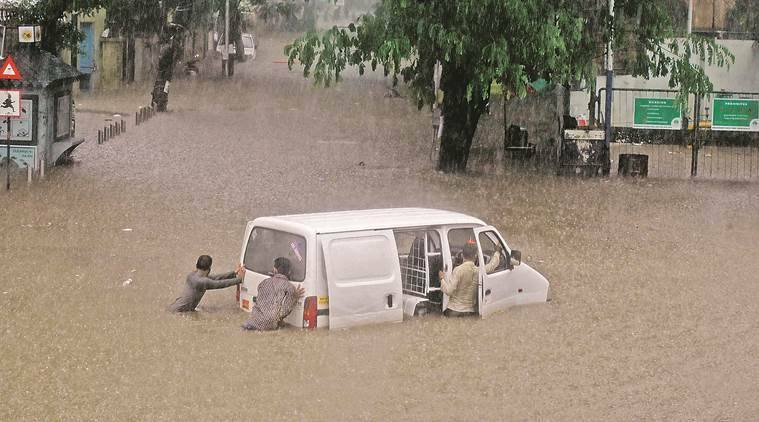 At least 10 houses in Navi Mumbai’s Kombudbhuj village were submerged. Local people said the ongoing work at the Navi Mumbai International Airport (NMIA) led to flooding. The coastal districts of Sindhudurg, Ratnagiri, Raigad, Thane and Palghar received heavy rains. Latur city in Maharashtra’s Marathwada region also witnessed a good downpour.